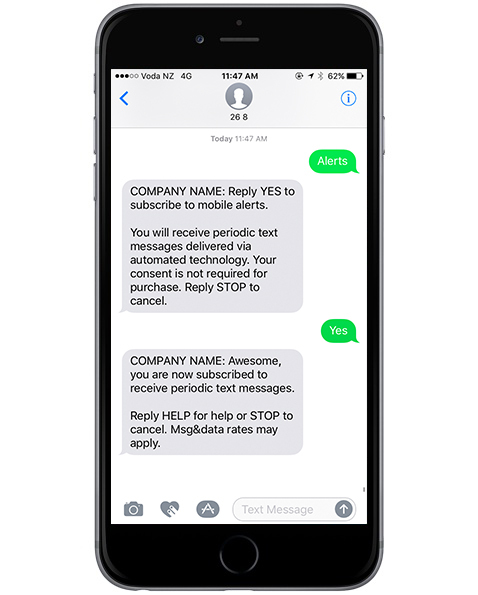 In MOBIT there are three different types of text messages: the opt-in, confirmation, and subscriber text. In this article, we will explain the confirmation text, who it is received by, where it is set up and its requirements. Contacts that are subscribers will receive the confirmation text if a subscriber text has not been set up. If the subscriber text is set up, only new subscribers will only receive the confirmation text. These are contacts who were not subscribers before triggering a send a text action or being sent a text manually from the contacts screen. 1 - Send a text actions added of keyword received and opt-in form submitted goals that follow a single opt-in process. 2 - Send a text actions added of keyword received and opt-in form submitted goals that follow a double opt-in process. 3 - Send a text actions added of goals (excluding keyword received and opt-in form submitted goals), timers (field, date, and delay) and response goals, where the option has been selected to send an opt-in text to contacts that are not currently subscribers. 4 - When sending a text to contacts manually, where the option has been selected to send a text to contacts that are not currently subscribers. Product quantity or recurring-messages disclosure i.e. Receive up to 5 messages per month, receive periodic text messages. "COMPANY NAME: Awesome, you are now subscribed to receive periodic text messages. Reply HELP for help or STOP to cancel. Msg&data rates may apply."